Daytona Bike Week offers 10,000 variations on everything Harley-Davidson. 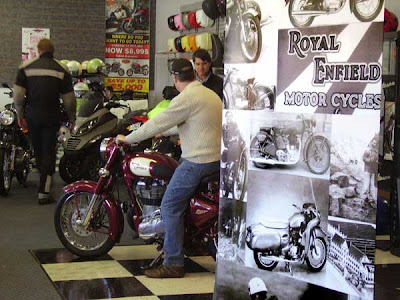 But a couple of brand new Royal Enfield motorcycles were the center of attention in the showroom of a scooter dealership, just up U.S. 1 in Ormand Beach. "Everybody likes them," explained Ryan Krachinsky of Scooter Superstore (which is now also Royal Enfield of Daytona Beach). That includes "Harley guys," he said, who come into the scooter store all Big and Bad and then ask "hey, got any Vespa t-shirts?" Sue, left, and Greta, Royal Enfield owners. The scooter store was the headquarters for the Royal Enfield Experience demonstration rides. Out in the parking lot next to the pretty green Royal Enfield G5 they bought were Greta and Sue, from Casselberry, Fla.
Their G5 was the very first (of at least three) Royal Enfields the dealership sold during Bike Week. They "just fell in love with it," when they saw it, Greta explained. They liked being able to take a demonstration ride and they liked the retro look. "Did you draw when you were a kid? I used to draw motorcycles and this is what they looked like," Greta said. This motorcycle is mainly for Sue, who plans to get her motorcycle endorsement and use the Royal Enfield for back roads. 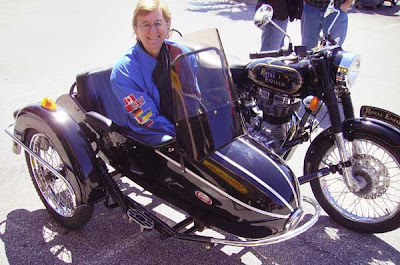 Also smiling was my secret weapon, blogging consultant, photographer and wife, Bonnie, who shot the pictures for my Daytona Bike Week series of posts while riding in a sidecar. 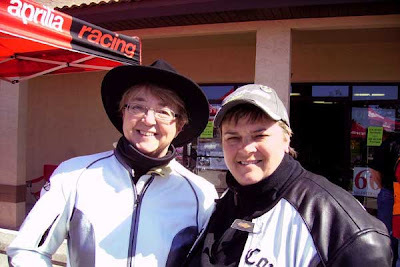 It was piloted by an experienced sidecar driver, not me, which meant I got to be in her photographs, riding solo. Bonnie said the sidecar was windy and cold and not very smooth. But she smiled when she said it. Perhaps a guest blog post is in order? I personally would like a first hand account of the sidecar experience, seeing as that is the closest I will most likely ever get to riding a RE.